ePosters - SELF-ESTEEM AND SELF-IMAGE IN A GROUP CHILDREN FROM 6 TO 11 YEAR OLD WITH DENTAL ALTERATIONS. 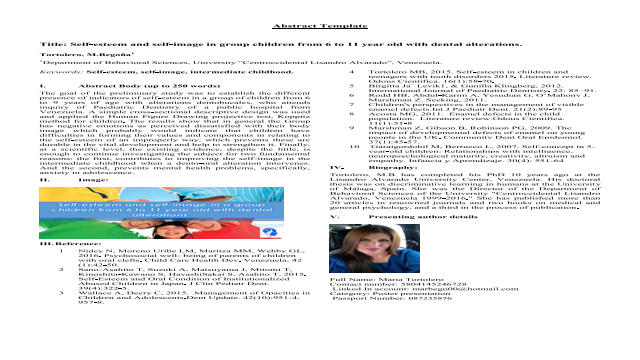 Poster Title: SELF-ESTEEM AND SELF-IMAGE IN A GROUP CHILDREN FROM 6 TO 11 YEAR OLD WITH DENTAL ALTERATIONS. Abstract: The goal of the preliminary study was to establish the different presence of indicators of self-esteem in a group of children from 6 to 11 years of age with alterations dentobucales, who attends inquiry of Pediatric Dentistry of a public hospital from Venezuela. A simple cross-sectional descriptive design was used and applied the Human Figure Drawing projective test, Koppitz method for children. The results show that in general the Group has negative emotions as perceived dissatisfied with their self-image which probably would indicate that children have difficulties in forming their values and components in relating to the self-esteem of an improperly way, which prevents these are durable in the vital development and help to strengthen it. Finally, at a scientific level, the existing evidence, despite the little, is enough to continue investigating the subject for two fundamental reasons: the first, contributes to improving the self-image in the intermediate childhood when a dento-oral alteration intervenes. And the second, prevents mental health problems, specifically, anxiety in adolescenceSummary: The goal of the preliminary study was to establish the different presence of indicators of self-esteem in a group of children from 6 to 11 years of age with alterations dentobucales, who attends inquiry of Pediatric Dentistry of a public hospital from Venezuela.References: 1	Nidey N, Moreno Uribe LM, Maritza MM, Wehby GL, 2016. Psychosocial well- being of parents of children with oral clefts. Child Care Health Dev. Venezuela, 42 (1):42-50. 2	Sano-Asahito T, Suzuki A, Matsuyama J, Mitomi T, Kinoshita-Kawano S, HayashiSakai S, Asahito T, 2015. Self-Esteem and Oral Condition of Institutionalized Abused Children in Japan. J Clin Pediatr Dent. 39(4):322-5. 3	Wallace A, Deery C, 2015. Management of Opacities in Children and Adolescents.Dent Update. 42(10):951-4, 957-8. 4	Tortolero MB, 2015. Self-esteem in children and teenagers with tooth disorders 2015. Literature review. Odous Cientifica. 16(1):58-70. 5	Birgitta Ja¨ Levik1, & Gunilla Klingberg, 2012. International Journal of Paediatric Dentistry. 22: 85–91. 6	Rodd HB, Abdul-Karim A, Yesudian G, O’Mahony J, Marshman Z. Seeking, 2011.